The Mistress premiered on Wednesday, August 29 at 8pm on Slice Canada. The new reality television series showcases the lifestyles of women who are entangled in a forbidden love relationship with a married man. This contemporary show features Sarah J. Symonds, a proclaimed mistress who has left that life and is now helping women all over the world get out of toxic relationships. Sarah shares her firsthand knowledge on dating and relationships in each episode of The Mistress. Women from all walks of life seek advice from Sarah. She empowers women to escape the triangle of deceit. Watch full episodes and weekly recaps on slice.ca! 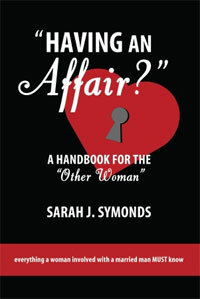 Being the sole author of the self-help book ‘Having an Affair’, Sarah reveals the secrecy involved in being a mistress. With Chapters titled: ‘How and Why Married Men Stray’, ‘Single, Female, and Desperate?’ and ‘Surviving Christmas as a Mistress’, Sarah shares her insight on being a mistress. Sarah’s list of things you should know if you’re a mistress. • You’re not alone! There are many other women just like you in the same situation. • You’re not a bad woman. You’ve just made some bad choices. I can help you start making some right ones. • You don’t have to keep living this life! You deserve so much better. Sarah is an accomplished woman; having made an appearance on the Oprah show, being the founder of the Mistresses Annonymous support group, and writing her own blog Pillow Talk. She answers questions like “Is sexting cheating?”, “Is flirting on Facebook cheating?” and “Why is the other women always the one to blame?”. This entry was posted in The Mistress and tagged marriage, Mistresses Annonymous, Oprah, reality television, relationships, Sarah J. Symonds, Slice, The Mistress, The Promotion People, women on September 2, 2012 by press.